I love producing rayon scarves. I like their drape and the fact that rayon is made from cellulose. So I went to my stash. I had some lovely handpainted rayon boucle from Tammy in a colorway she calls Surreal. She’d done some custom dyeing for me, with a coordinating navy-black yarn. So I set the counterbalance loom up to do a point twill. For the first scarf (on the right in the photo) I used that solid color yarn. Although usually a dark color yarn brings out the richness of its surroundings, in this case it made everything too dark. Especially for a summer scarf. So for the second one, I used a solid bright blue rayon (on the left in the photo). I liked it, but not enough to make the third one the same. I chose a light purple for the third and final scarf. I like that one, too. In reality, both the blue & purple scarves are still darker than I’d envisioned, darker than I wanted for summer weight scarves. The one made with all boucle is an interesting texture. It doesn’t have rayon’s typical smoothness and sheen, but is rather nubbly, as a boucle should be. 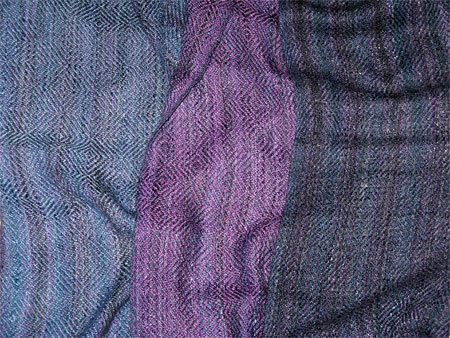 The weft on the other two is a smooth rayon, so the overall scarf is much smoother. I’m happy with the quality of all three scarves, and with their light weight. I’m sure someone will like them, even if they don’t sell this summer.